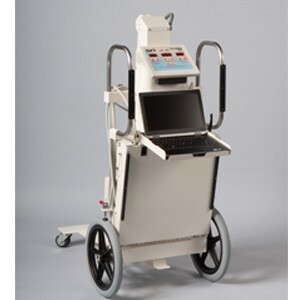 Built on a SR-130 or PowerMax 1260 Platform - these mobile x-ray systems are designed for fast, easy radiographic imaging acquisition and uncomplicated transmission and storage of the digital image. Source-Ray's Digital Systems provide an affordable, practical and convenient solution for Healthcare Professionals transitioning from CR to DR technology. SRI Digital Systems are a turn-key solution that includes everything you need in one easy package. High quality 14x17 Wireless Digital Panel for excellent image quality with low x-ray dose and fast exposures. Advanced imaging software with easy archive, print and send tools. Store away laptop computer and Tilt Out panel storage cabinet for easy and safe transportation of both the digital panel and the grid adapter. See the SR-130 Film Based Portable x-ray system page and the PowerMax 1260 page for specific information about those systems. Specifications are subject to change at any time.